This post has a lot of code in it because there are a lot of moving parts. Go ahead and create a new ASP.Net MVC 5 project, then add the Telerik artifacts as described here. Note: The instructions say to put the @Scripts.Render(“~/bundles/kendo”) after the @Scripts.Render(“~/bundles/jquery”), which is true. What it doesn’t tell you is that BOTH lines need to move to the top of the page, in the <head> section or the Kendo UI components won’t render. Before we begin creating the UI we need something to search in. I am using a simple number generator to create 10,000 items to search through. Each SearchResult will have an Id (which is a number from 1 to 10,000), and a Description (which is the same number, prefixed with the letter ‘A’). //Return empty list. Option: Or return everything. Now we have something to search, we’ll need to setup the page that will host the Window. Notice the use of the span and the glyphicon-search to put the magnifying glass in the top nav bar. This was hard to figure out, but if you take the sample code you can put several buttons off to the right. Right click in the Controllers folder and add a new empty MVC 5 Controller named SearchWindowController. You’ll also need to create a simple search window view. Right click in the controller’s code and select Add View. Choose MVC 5 view and name it SearchWindow. Be sure to select ‘Create as a partial view’. Leave the view empty for now. You should be able to test it now without any errors. Run the app and click the search icon, the empty Window should appear. The next step is to add the Kendo AutoComplete box to our Kendo Window. Note the places where we link to the AutoComplete action itself, bind to the DataSource and to the events for Select and Change. Now, finally, we should have some run-able, testable code. Give it a whirl. You should be able to run the project, view the Search Window, see the AutoComplete box, and type a sample search string that displays results in the drop down (remember our sample searchable data is A1 to A10000, so a value of A22 should return results in the drop box). This is the last step. 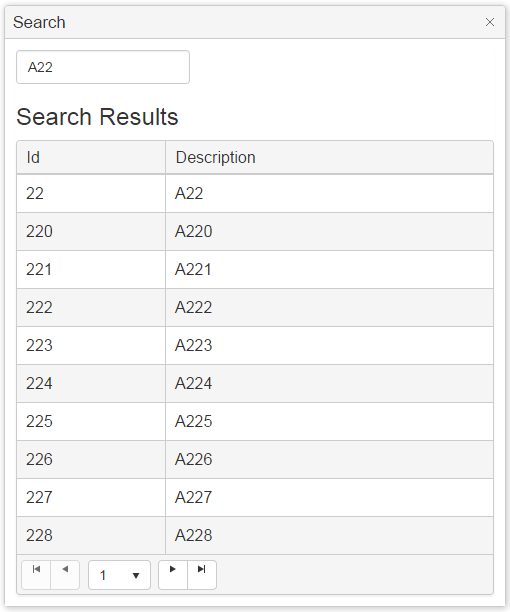 We want to show the items that match the search term in a list panel (Kendo Grid). Note: If anyone knows how to cache the Searcher class so that we don’t have to instantiate it in both the Autocomplete method and the GetSearchResults method, please let me know in the comments. And there you have it. The completed project with a Kendo AutoComplete box populating a Kendo Grid, with both in a Kendo Window. Woohoo. Here is the project source code so you can load it and play with it yourself.